“No Justice No Peace” is what a lot of protesters proclaim as they destroy local businesses and neighborhoods. It sounds oxymoron. They don’t use logical thinking but instead their actions are based off of emotions. Throughout the world we are seeing social unrest due to faltered justice systems and even economic declines or collapses. It doesn’t seem to be dying down anytime soon. Instead it has continued to grow quickly and more intense. Sometimes rioters and looters don’t think before causing destruction. Yet you still have those low lifes who have specific targets. For example, rioters in Ferguson 2014 targeted white neighborhoods and store owners (The Political Insider). Which of course these people have nothing to do with the justice system or things that have happened prior to. These rioters thrive off of destruction. Lately we have even seen cops being killed during these protests. If these scumbags are willing to target law enforcement then regular citizens are susceptible to these attacks as well. So instead of staying and trying to hold your ground it best that you evacuate the area. Unfortunately you may lose valuables and maybe even have your business destroyed but your life and those of your family are more valuable. 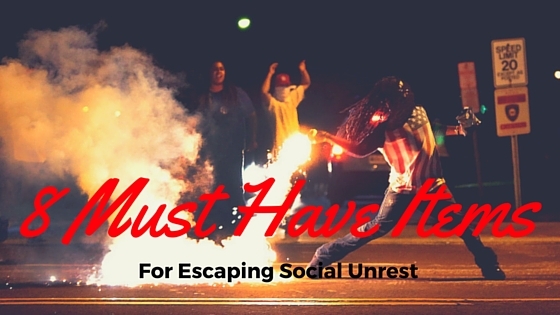 Now social unrest will not be reason enough to go to a bug out location. However, you should of course grab your bug out bag and head to a retreat location or safe place. Such places could include family and friend’s houses, a cabin, camping grounds or even hotels. Bugging out would mean that you are not expecting to return which I think there is still the possibility of in this event. So in your bug out bag you should of course have all the items that we typically talk about that you can find in the Ultimate Preppers List. However, I believe that there is a need for a few things in particular that should be included. They may not necessarily need to be in your bug out bag but maybe in your vehicle survival kit. Of course you should already have your concealed carry weapon along with other items included in your P.A.C.E. (Primary, Alternative, Contingency and Emergency) layers of self-defense. Included in those layers I would recommend pepper spray. Not every encounter will warrant the use of a hand gun. Pepper spray can either warn someone or give you distance from them before escalating to the next level of self-defense. If you get caught in a riot you might have to find a safe place for shelter. There could be police surrounding the riot so it will be hard to get out. Especially if those officers believe you are involved in the riot. In that type of situation you will want to find some safe building hopefully with multiple stories. A lock pick set will help you get into a space and head to the highest level away from the ground. Now this is breaking and entering. So you could definitely get in trouble. However, if it comes to deciding between your family’s safety and being charged with trespassing I would take the risk. Now police scanners are really becoming obsolete in our day because police stations are moving to a different system that is encrypted. However, there are still many police stations that you can listen to on a scanner or even HAM radio. Listening in will give you intel on where the riots are moving which can help you to better navigate away from the area. It will also give you time to prepare if you know if the officers are about to bring out tear gas or any other measure. I’ve done a review of the Baofeng UV-5RA which is a cheap ham radio. It provides with the basics of storing channels or scanning frequencies. You can also learn more about programming those police frequencies into the Baofeng. Many times you can find the frequencies by checking out Radio Reference. Maps with preplanned escape routes should already be in your bug out bag and get home bag. However it is worth reiterating. You should know the choke points of your area and have alternate pathways of travel like railroad tracks or back alleys. It wouldn’t hurt to have a small armored plate in your EDC bag and other emergency bags. For your EDC bag I would recommend getting a sling bag that you can quickly move to your front and cover your chest when you hear gun shots being fired. Many of these sling bags have a section where you can insert a laptop or tablet. It is the perfect size for an armored plate. Whenever you see riots on TV tear gas is almost always involved. Now it may not be deadly but it can really mess you up. If you are caught in a riot you will want to have some sort of protection from this to help you navigate away from the location. Again, medical kits should already be in your bug out bag, get home bag and I would even recommend having a small kit in your EDC bag. The most important part that I would recommend for this scenario would be a tourniquet. This can help you stop the bleeding in case someone gets shot or stabbed until you are able to find help from first responders or the hospital. Trying to escape from a riot you may see that there are fences that are blocking you from a safer path of escape. Being able to cut through a wired fence could be a matter of life and death. Plus there are different size wire cutters so you don’t have to be carrying around a heavy pair all the time. As with any other post these are just my suggestions. What other items do you think would be important to have beyond what we typically have in a bug out or get home bag? Leave a comment below because your feedback helps the prepper community.